The time has come to test our prototype design for the MK7 intake. After weeks of designing and fabrication, the prototype for this VW is now ready to hit our Dynapack dynamometer so we can collect some data. Testing these prototype MK7 GTI parts for overall power output gains over stock is important, so that’s the first thing we needed to figure out. The larger diameter piping compared to the stock system provides increased airflow that will have a direct impact on improving power output. This car did happen to come with an aftermarket stage 1 tune on it, so we tested our intake with that software upgrade. We also wanted to provide sound clips of the car with the intake on so you can hear the difference. Below, we have some footage of the MK7 running on the Dynapack, so check it out! Our first impression was that this MK7 GTI intake is a big improvement, especially with regard to sound. You can hear the turbo spooling up and the sound of the diverter valve when letting off the throttle. It isn’t too obnoxious, but at the same time you certainly hear more of the exciting stuff! Also, you may notice that the SAI (secondary air injection) filter adapter isn’t attached to the box. Don’t worry, as this is only a prototype design we were testing. In our finalized version, we will certainly offer the option to have an SAI attachment with the appropriate filter. For strictly testing and dyno purposes, the SAI adapter does not need to be attached to the box, as it will not affect performance or drivability. More on that later. The graph below shows average data curves of power and torque from all our runs. 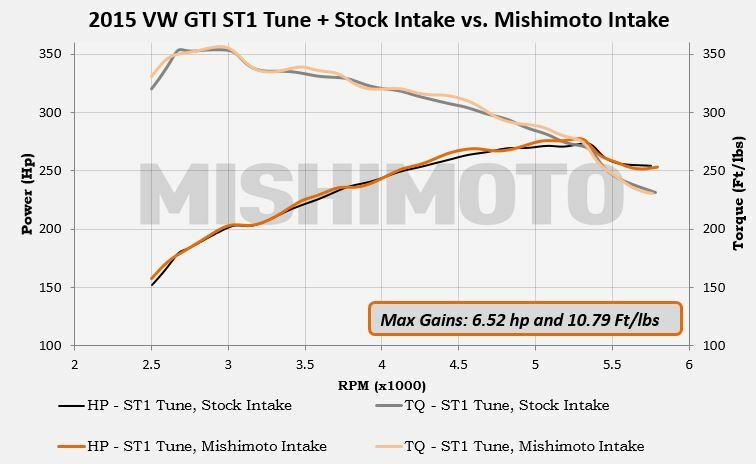 The stock tune with the stock intake is plotted against the stock tune with the prototype intake. Throughout the majority of the MK7’s power band, we were able to achieve consistent power increases, with the peaks of power occurring later in the range. On a stock tune we saw an improvement of 11.63 hp with 14 ft-lb of torque! 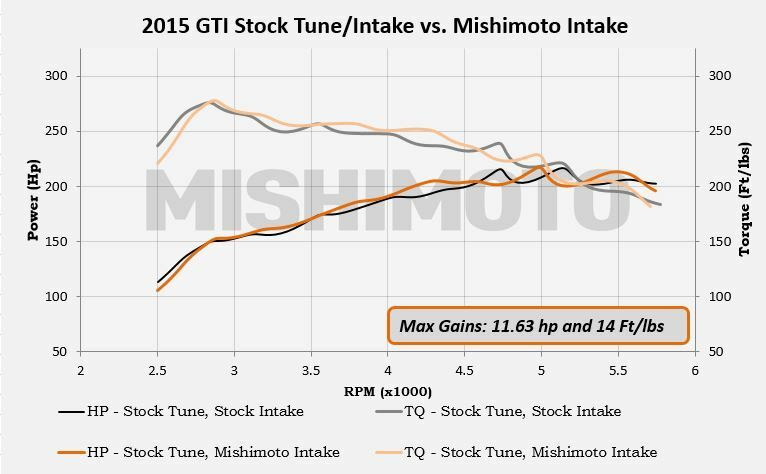 If you look closely at the graph, you’ll see fairly consistent gains throughout the RPM range. From about 4,500 rpm onward, the band simply shifted forward a bit due to its reaction with the intake. This less restrictive system makes the induction process more free flowing. Even with the stage 1 tune allowing this GTI to make about 260 hp at the wheels, we were still able to see consistent gains throughout the RPM range. Here we had maximum power gains of 6.52 hp with 10.79 ft-lb of torque. Check out the plot below. Since we are looking at several different plots, it is important that we monitor the air-fuel ratios (AFRs) to ensure that they stay at safe operating levels. Check out our AFR graph below. 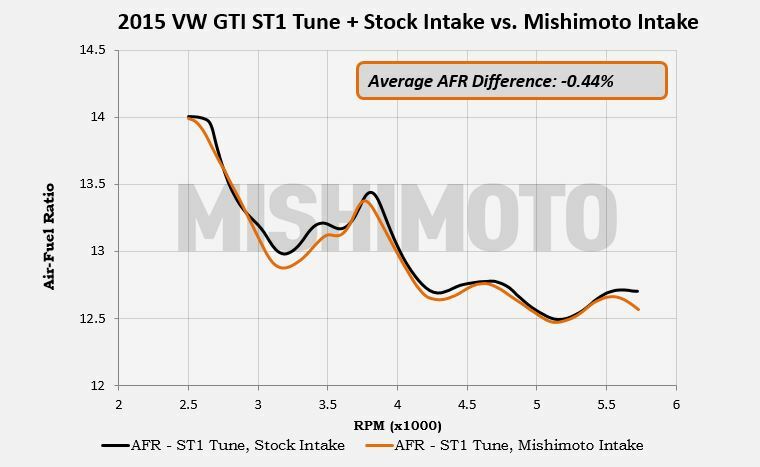 As you can see, with the tune, the AFRs are in great shape, with the only minor deviation occurring on the 3,000–4,000 rpm range. The average change in the AFR was 0.44% on the rich side. So to all of you with tunes and aftermarket MK7 GTI parts, you’re safe with installing this intake. This isn’t the final design of the intake. We are currently working on finalizing the renderings of these MK7 GTI parts, so stay tuned!